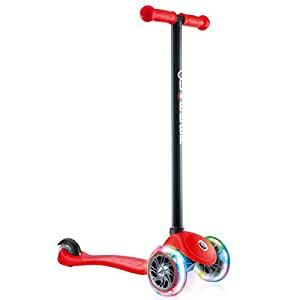 In an increasingly digital world, Globber Scooters is determined to redefine outdoor fun. 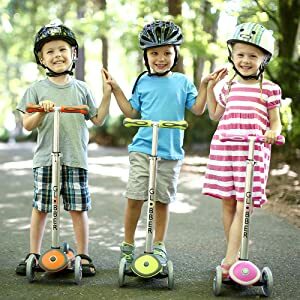 On their scooters, kids can take back the neighborhood, connect with peers/neighbors, and stay physically active. Globber Scooters products showcase just how easy and fun it is to use a scooter through their sleek design and unmatched function. Globber believes that safety can never be undervalued and all products meet or exceed worldwide safety certifications. 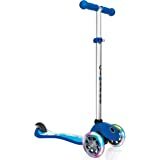 Thank you for your interest in the Globber Scooter experience! 3-wheel scooters are made for young, learning riders before they graduate to a 2-wheel scooter. 2 wheels in the front means the scooter requires a larger turning radius than a traditional 2-wheel scooter. 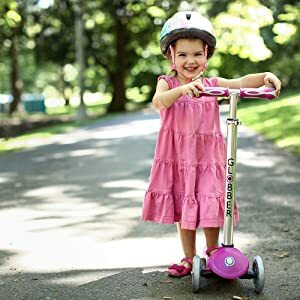 The child must lean with the handlebars to steer, which engages the pivot with ball bearings that turn the front 2 wheels. 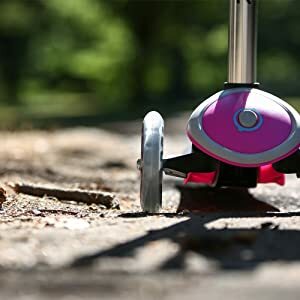 Larger wheels in the front offer greater stability, especially when rolling over sidewalk cracks or rougher surfaces. High-rebound PU material and ABEC 5 bearings create an extremely smooth ride and lasts longer than other wheel materials. 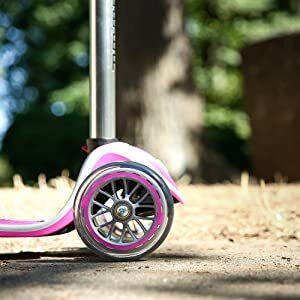 This scooter is nice and quiet, music to parent’s ears! The handlebars can be easily removed from the deck by the push of a button. 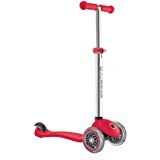 The scooter comes apart into 2 pieces by pushing in the red button on the base of the handlebars, close to the deck. This makes it easy to travel with, carry into a restaurant or place in the car. TRP material is proven to be the longest lasting material for handlebar grips. They provide maximum comfort for all day riding. 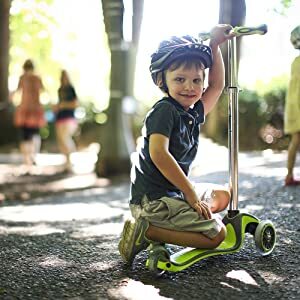 Sometimes young children have a hard time learning to balance on a scooter. 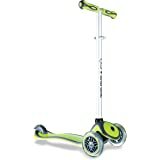 The steering lock mechanism (button on the face of the deck) locks the steering so the scooter moves in a straight line. This allows the child to learn to balance before they need to steer. Unlock the steering by easily pressing the red button on the bottom of the deck. Globber Scooters is the only brand on the market that offers this feature! 110lbs, which is more than double other leading brands. 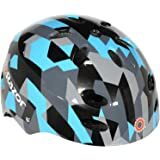 The deck is made up of hi-impact PP with an anti-slip texture, a fancy name for a durable hard plastic material that will withstand the gentle play of a child. The PP material is high end (made to last) and has a clean and sleek look when compared to other children’s outdoor toys. The deck is also reinforced with a steel plate to give it strength and durability.